Everything this classic romantic comedy taught us about life, love, and friendship. This was the pinnacle of '90s romantic comedies gone wrong. It centered around Julia Roberts' big hair, Dermot Mulroney's smile, and Cameron Diaz's innocent charm – that's right, we're talking about none other than My Best Friend's Wedding. 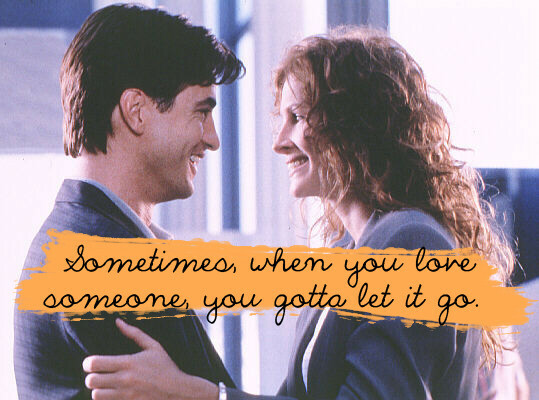 A long-time favorite of mine, mostly ever since I realized that Dermot Mulroney was actually my soulmate, I fell head-over-heels with the ideals of love, friendship, life and yes, regret and heartbreak that this unexpected-yet-still-cheesy film espoused. (No pun intended.) Also, let's kindly ignore the fact that I was six years old when it came out, and therefore obviously in no place to run away with Mr. Tall, Dark and Handsome in the manner of which Julia Roberts's character could only imagine. But hey, a girl can dream, right? Here are some of the most important lessons My Best Friend's Wedding taught us about life, unrequited love, the importance of friendship, and most importantly, getting over a broken heart. You can never go wrong with tall, dark, and handsome. Or, you can go seriously, devastatingly, heartbreakingly wrong, depending on how you interpret the movie. Sometimes you just have to burst spontaneously into song. This is also known as the moment that you wish real life was actually like the movies. And sometimes, you'll want what you can't have. 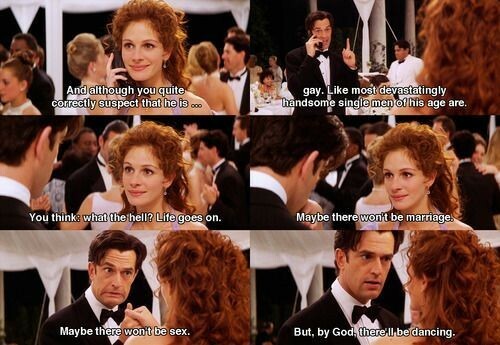 Yes, even if you're Julia Roberts. Even if you don't want to accept that your best friend is really in love with someone else. Even if you try to sabotage everything when you finally realize that you love him back. Even if it took you nine years and your dream guy's impending nuptials to Cameron Diaz to get there. This only makes it even more important not to let defining moments pass you by. "If you love someone, you say it – you say it right then, out loud. Otherwise, the moment just...passes you by," Mulroney's character Michael O'Neal tells Julia Roberts's Julianne Potter. Yet even as the viewer realizes that this is undoubtedly a life-changing, defining moment of the kind that won't come around again – she remains silent, missing her chance. She won't have another to tell Michael just how much she really loves him, until it's already too late. As a side note: This scene also taught us exactly how dramatic irony should be handled in movies. So fight for what you love, when you have to. We have to say, if this were your average '90s rom-com, Jules probably would have gotten her man in the end. But part of its charm as a movie (and a factor that made it seem ahead of its time way back in 1997) is that the ending is actually fairly unexpected – in other words, distinctly lacking a happily-ever-after. At least, for Julia Roberts. Just don't underestimate the power of letting go. Because in the end, no matter how crazy and unhinged and desperate love might make you, selflessness will always trump selfishness. Every girl needs a best friend who will always keep it real. Bonus points if they go so far as to pretend to be straight for you. Just like she deserves said friend to come to her rescue when she really needs it. Best. Movie. Quote. Ever. Can I get an amen? So maybe there is a happy ending after all. Because really, if it's a problem that isn't solved by dancing, I don't want to hear about it. Don't try to change who you are for someone you love. If they really love you, they'll love you for who you are – whether that's creme brûlée or jello. In conclusion... Do the right thing. Also, Julia Roberts looks better in a bridesmaid's dress than anyone should have the right to, before or since. In conclusion, do the right thing, even if that means you don't end up with the man of your dreams. Love should never be about changing yourself for the worse – even if that means you just turned the quintessential rom-com trope of the Hollywood happy ending on its head. Even if that means you end up alone. Even if that means you'll have to watch the love of your life masquerading as your best friend get married to someone else, then pick up the pieces on your own. Or more accurately, with your actual best friend. My Best Friend's Wedding taught us that that's okay – because though you may have compromised your integrity on the journey, you ultimately reached the destination without destroying your inner moral compass. You might not end up with the happy ending you wished for (or that we were all rooting for!) but you did the right thing, and that's one thing you'll never regret.